SAN FRANCISCO – Nearly 20 percent of Apple Watch buyers are not only shelling out hundreds of dollars for the timepiece but are springing for a spare band too, giving the tech giant a profitable second dip into customers’ wallets, according to data provided exclusively to Reuters. The data from Slice Intelligence, a research firm that mines e-mail receipts, offers a rare window into the money-making potential of Apple’s first brand-new product under CEO Tim Cook. The ever-secretive company has yet to release how many units of the watch it has sold, let alone how profitable it is. Slice estimates the company has sold 2.79 million as of mid-June. 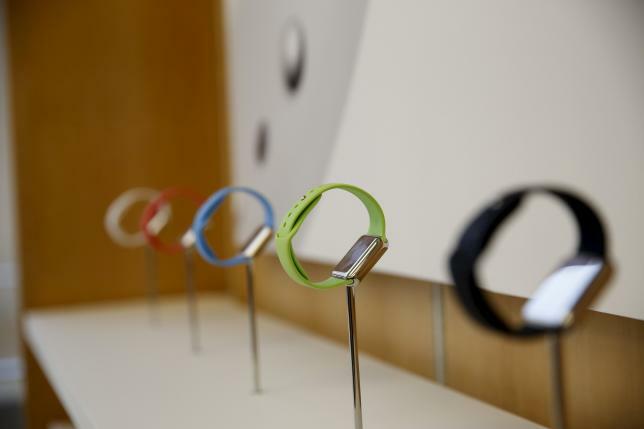 But if the band purchases are any indication, sales of the watch itself are just the beginning of Apple’s profits. Although the entry-level sports band retails for $49, it costs only about $2.05 to make, according to an analysis of the 38-millimeter size by IHS, a technology research firm. The estimates do not include expenses such as packaging and shipping and may not capture the full cost of the material Apple uses to make the band, said analyst Kevin Keller of IHS. With the watch, Apple has put a high-tech spin on the razor-blade business model, in which a company sells a product for a modest price and then profits from sales of accessories, he said. “Of course, because it’s Apple, it’s sell the razor, sell the blade,” Keller joked. Slice studies e-mail receipts from a panel of 2 million people representative of online shoppers in the United States, more than 20,000 of whom bought an Apple Watch. Data from Slice, which analyzed only bands made and sold by Apple, showed about 17 percent of shoppers purchased more than one band. Slice says its data lines up closely with information from the Department of Commerce as well as Amazon sales data. The black sport band is the most popular choice for both the band that comes with device and extras ordered by consumers. But the $149 Milanese loop is the second-most popular second band, suggesting many consumers are pairing a practical sport band with a more luxurious option to make the watch more versatile, said Kanishka Agarwal, Slice’s chief data officer. “People are trying to get two watches in one,” he said. The entry-level Apple Watch sport model – which starts at $349 – has been the most popular among early shoppers, according to data from Slice. But an extra band – which fetches as much as $149 for the quilted leather loop and $449 for the stainless steel link bracelet – can raise the cost considerably. The popularity of spare bands suggests some consumers may be spending more on the Apple Watch than they intended. Former Apple executive Jean-Louis Gassée, for example, went with the sport model for his starter Apple Watch, reluctant to invest too much in a first-generation product. But he did not skimp on bands, purchasing a black quilted leather loop and a white sport model. He reaches for the leather for business meetings and swaps it out for the rubber model when he heads to the gym. Distinctive bands help customers match the watch to their outfits and lend the gadget a more personal feel, which is key to the appeal of wearables, said Allen Adamson, who is chairman of North America for Landor Associates, a branding firm. “Apple needs to win the functional war, but they also have to win the fashion campaign and make it fun to wear,” he said. Apple has opened the door, creating a platform for third-party developers to design bands of their own. Apple will not share in the revenue from sales of those bands, according to a person with knowledge of the matter.